Gain insights into Sahaja Yoga from a New Zealand perspective. What, exactly is Meditation, you may ask? Many people are asking this same question. Over recent years, as "life" has got busier, more complicated, and faster, the search for "antidotes" for this has given rise to quite a few groups- many selling meditation. Meditation is a "state" of silent awareness, where there are no thoughts,just pure awareness. Do I hear you say that's impossible? Many people do believe that there cannot be a waking moment, when we are not thinking, when the brain is taking a rest. There are people in their 70's and 80's who practice Sahaja Yoga Meditation. I am one of them, having found it in 1984, in Auckland. 24 Years later, I feel very lucky to have enjoyed regular practice of it into my 70's. It has looked after me very well. I found it is so important to give the brain a rest, to stop those incessant thoughts many, trivial, worthless, and also negative. For me, it all started when I had the responsibilities of running my own trucking business. I was the "boss", I was the driver, but also, the labourer, the accountant, the maintainence assistant, and P.R. person- I was "it".So I got physically, and mentally exhausted. Life seemed to be passing me by. I was in my later 40's, and wondered where life had gone, and what was in store? One day I rose before 4am, took aload to Hamilton, was back about 10.30, and kept going till 6pm. I arrived home shattered.I lay down, straight away going into a deep sleep. 1/2 an hour later, I came awake into a beautiful state of extreme bliss and peace, which I had never experienced before. For 2 to 3 hours I was in this beautiful state, feeling completely safe and protected, with such a feeling of love enveloping me. I couldn't think - and didn't want to.....I repeated this scenario each night for 2 months, in this blissful state. Then it started to drift away, finally and devastatingly, dying away completely. I felt so lost.... I started searching here and there for a means to restore it. Many people had commented how different I looked - so peaceful and contented. After 2 very long years of seeking, I saw an advert in The N.Z. Herald for a free Meditation Class. I took my 12 tonne truck along for transport. The class made complete sense to me about several things, and helped me understand what "state" I had approached in my spontaneous meditation. The lovely people - all New Zealanders - were able to make me aware of my inner self. So that I felt on my hands a coolness, and the top of my head went cool. I had found the answers to my 2 year search. It was called Sahaja Yoga Pure Meditation. Sahaja means born with you, inside you; Yoga means Union- uniting. As we are built in a special way in our evolution, we have an energy within us that corresponds to our Pure Desire to ascend and to evolve. When this is raised in a simple way. just requiring this pure desire to be present, we are connected to the subtle power which is all around us, which is carrying out this amazing evolution. This energy called Kundalini- meaning it's in a coil- takes us into meditation when it rises up and passes through the brain.We are then connected to this subtle, but great power. Shri Mataji Nirmala Devi, the lady who was the founder of Sahaja Yoga Meditation, named it Self Realization, meaning realizing, finding within, our true self - the reality of what we are. 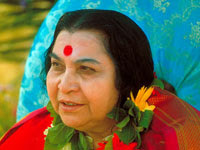 Shri Mataji was born in a Christian Family, with Royal origins. Her father was the first Christian member of the Indian Parliament. The whole family had taken a vital part in the Indian Independence Movement, and they spent much time in and out of jail. Mahatma Gandhi recognized the special qualities that Shri Mataji had as a young girl, when she stayed in his Ashram. If you would like to find out about how to get this awakening, go back to the Website, and Click on to the links. The Classes are always FREE, there will most probably be one not far away.